In the beautiful autumn sunshine at the weekend we went to visit a landmark we have been driving past the last 18 months, the 'giant head' as I affectionately knew it. Thanks to the way in which AA signs have a habit of giving up on you when you're only half way there we drove all the way around it numerous times before finally arriving, all the time able to see it but frustratingly unable to pick our way through he surrounding fields. We almost gave up when at one point it felt we were nearer home than the statue! I'm not sure I should admit but I didn't previously realise what the significance of the site was. Luckily an information point and my husband filled me in. 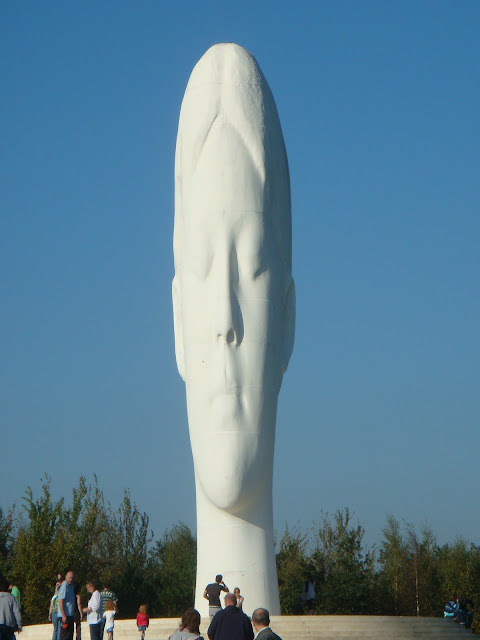 The 'giant head' is actually a sculpture called The Dream created by Spanish artist Jaume Plensa on the site of a former coal mine at Sutton Manor Colliery in St Helens. Dream was commissioned by ex-miners and St Helens Council as part of Channel 4's Big Art Project. Piensa decided on the sculpture of a girl's head with her eyes closed as in a dream like state after talking with former miners from the site. He said "I learnt a lot through talking with the miners. All they spoke about was darkness and I wanted something to reflect the light. Light become a dream when you're working in darkness." Today these words are so poignant as the rescue operation of the 33 Chilean miners trapped in the darkness for 69 days is underway. Since coming in from work I'm hooked to the coverage of these men coming back into the light. To the scenes of joy and jubilation as the men are reunited with their families. What an ordeal all of these people have been through and how amazing that all over the world we are united in watching this inspirational real-life rescue operation which could just as likely (and no doubt will be) a Hollywood movie. My favourite story is that of the baby daughter of the one of the miners, 'Esperanza', who was born a month ago. Her daddy has some nappy changes to catch up on! So for my Gallery entry this week, for the theme 'Favourite Photo' I have chosen my favourite photo of today, in tribute to the miners in Chile and all involved in the rescue operation. Such a great post and a fasntastic photo. I am glad that all the miners are now safe and rescued. Thank you for commenting on my blog! Hi there, thanks for stopping by my blog. I think your photo and blogpost are just brilliant. Perfect for what's been happening in Chile. What an inspired post! We don't live far from this and I drive past it on my way to work everyday(when I'm not on mat leave, obviously). Would you say it was worth a visit then? Looks like it from the pic, which is great, btw!